If you remember correctly, I love the census. Well apparently, not only do I love it, but I am really good at it. 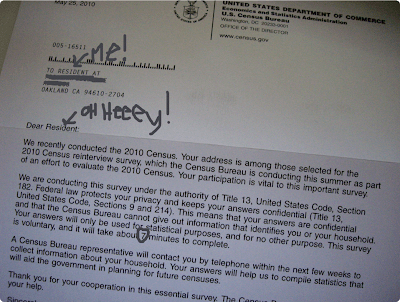 Because I was asked by the leaders of the Free World's Census Bureau to do a REinterview. See? 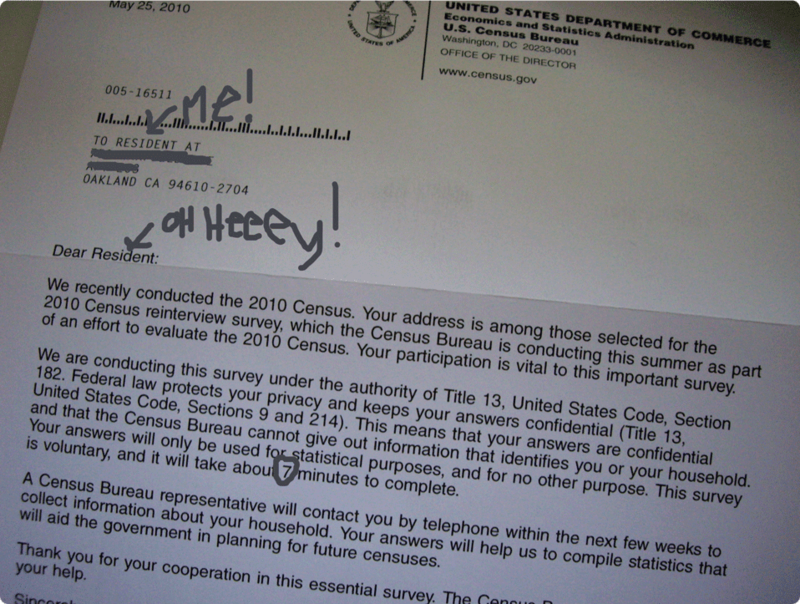 So basically a "reinterview" means that they have more in-depth questions, based off my answers from Census 1.0. This is funny to me, because most of my answers were "no" or "white." Now let's talk about the government. My government seems to be under the impression that the time a 23-year-old, single resident, white girl is most available between the hours of 7 pm and 9 pm on Friday and Saturdays. Needless to say, I didn't answer the first three times they called. I respect the Census, or at least I fear the government enough not to do an interview with them at a bar. I might be able to out-sass Barack, but Joe Biden doesn't mess around. Finally, one particularly sunny Thursday afternoon, around two, Beverly from the U.S. Census Bureau got ahold of me. Now, I'm the first person to admit that when it comes to diversity and uniqueness of citizenship, I'm the United State's worst example. Single. Female. Early 20's. White. But for some inexplicable reason, they wanted to delve further into my socioeconomic and cultural credentials. So we start with my name. Eleanor. E-L-E-A-N-O-R. One more time? E. L. E. A, as in adobe. N. O. R, as in resistance, as in futile. Last name. (dear lord.) T-H-I-Beta-E-A-U-Xena, as in "the warrior princess. Oh, Thibodeaux? No. Thibeaux. Tee-bow. Oh like Tim? No, nothing like Tim. Oh. Four and a half minutes later, we've moved on. Now it's about my age. How old were you on April 22, 2010? So you are now how old? This was my favorite part of the interview. Never in my life have I ever felt so culturally devoid. The game was "yes" or "no" and the list was infinite. Are you: White? Yes. African-American? No. Hispanic? No. Asian? No. Native American? No. Pacific Islander? No. Another race not previously named? No. If someone asked you what race you were, what would be your natural answer? White. Then Bev, cause I think at this point, we're nickname status, and I requested she just refer to me as "citizen" due to my affinity for all things Star Trek, asks me to think about how "others" perceive me. Do other people think you are White? Yes. African-American? Really not. Asian? Nope. Hispanic? No ma'am. Native American? Never. Pacific Islander? Negatory. Other? Erm, no. The creative writer in me couldn't stand to keep saying the same word over again, as I put my vocabulary to the test trying to come up with new ways to say, "no." The Bevs is now laughing at me. Let's be honest, I'm laughing at me. Because the bottom line is, I'm white. At this point in the interview, I break it down for Bev-er-bee. "Would it help if I just told you that I'm incredibly pale? Seriously, it's impressive. Blindingly white." She asks me for the origin of my family. I am tempted to respond with, "Texas," even though I know she's just scouring my family tree for some kind of national allegiance. So I reply, "French and Scottish." Then dear, sweet Beverly asks me to spell Scottish. Oh, Bevz. Now we're going to play the "Often, Sometimes, Rarely, Never" game. She is going to list different ethnicities, and I will reply with the degree in which I have been mistaken for them. I laugh, because I can already see how this is going, but know that government jobs aren't exactly the most fun of careers, so I'm not going to give her a hard time. But I'd just like some credit, JFK, this is what I can do for my country. White? Often. African-American? Never. Native American? Never. Asian? Rarely. Really? No, Never. Hispanic? Nunca. What? Never. Pacific Islander? Never. 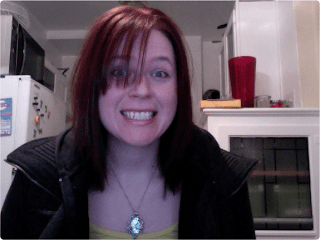 Have you ever been mistaken for a race that was not named? Is vampire a race? No. Then nope. Now she wants to talk about my parents. What race is your father? White. What race is your mother? White. How do you think I got this way? My favorite question was next. Eleanor, were you adopted? Man, this would be super awkward if I was and didn't know it. What did my parents census say? I'm gonna say, as far as I know - no. Are my parents divorced? Did I live in a foster home? Did I live with a step parent? Come on Bev, clearly I grew up in the 1957 suburbs. 2 parents, 3 kids, family dog, white upper-middle class family from Spring, Texas. I'm what the government wants to know about? Well Eleanor, that concludes our re-interview, thanks so much for your time. It's been real, Bev. Sorry to be so uneventful and stereotypical. Oh, that's okay. Have a good afternoon! Did you really say, "Is vampire a race?" Because that would be awesome. Also, I'm sure you made Bev's day by being the only memorable re-interviewee she's ever dealt with. Be proud. Second also, "I don't see nothin' wronngggggg!" Now that I have stopped shaking with laughter and dabbed the tears from my face, I believe I can say this is one of your finest blogs! Thanks for taking the mundane to unbelievable heights! You forgot to mention the "Goat" side of the family. ahaha oh that was glorious. Epic, really.